A complete waste of money,they were told by the residents that a carpark was needed up by the lakes but did they listen no. Some of the councilliors do not listen to what the residents want they are the people who have to live in the area and they know what goes on.There has already been trouble in there last week with lads in cars doing wheel spins around it,its just a magnet for trouble we have enough of that in the Ball court. They think its going to be like Queenswood Country park ,but who wants to park there and look at the weeds and thistles growing in the fields.The only people who go over the fields are local people who walk there dogs and don't use there cars to get there. The carpark up by the football pitches would have been okay to use as no one uses it only at weekends and then there are only a few cars which use it.Or a carpark up by the lakes this would then stop the parking on the streets around the lake and it would be better for the fishermen and women as then they would not have to carry there fishing gear so far. The other car park as everyone has said is already there and was put forward for consideration in the early stages, but Cllr Edwards did not want to use it, he wanted to build the one in Waterfield Road. Then at the planning meeting both Cllr's who live in Belmont influenced the planning committee to pass the application, one saying it is needed the other telling the planning officer he was happy to leave the decision up to her, much to the dismay of the residents from Newton Farm who attended the planning meeting. I spoke against the car park also pointing out the police report was also against it. The latest news is that Cllr Edwards is now proposing a 'lay by' car park to be built in Haywood Lane, which is what I ask for in the first place at the fishernen request. The money that was spent in Waterfield Road has totally been wasted, and the people living in Newton Farm has now got to live with the consequences of having a car park by the ball court that is being used for all the wrong reasons. Why didn't Cllr Phil Edwards listen to you Glenda and the residents.All the residents i've spoke to agree it is in the wrong place it should be up Haywood Lane.Also is it being locked at night to stop trouble as asked for by the planning officer.He won't be getting my vote and none of the residents around here will not vote for him either as he went against what we all wanted. Cllr Edwards doesn't listen to anyone, he has always thought he knows best for everyone, unfortunately Cllr Bridges agree's with everything Cllr Edwards wants, they work together on everything. Because I do not agree with them, they ignore what I say or do. I have and always will be 100% behind my constituents, listening to what you all say, and what you want. I am sorry to have to say this, but the only way they both will realise their mistake is if no one votes for them in 2015. I must say that I agree with Cllr Powell. It is every man and womanâ€™s duty to vote out Cllr Edwards and Cllr Bridges who works full time and does not appear to do the work for the constituents. Yes he wrote an article in the paper about Amey but what has he done about the supervision of Amey nothing. Cllr Powell is very active and helps her constituents she works relentlessly helping the people of Newton Farm, Belmont and Hunderton, but what have the dynamic duo done for Hunderton and Newton Farm? We must all do our best to support Cllr Powell who lives in Newton Farm and very close to Hunderton and knows the problems that occur. I ask what does the dynamic duo know about Newton Farm or Hunderton? Lpusseycat I think he thinks himself as God, and knows what is best for us all. I received today the permission from the planning dept to put the following on this site also my own website. As you should be aware there was a planning condition attached to the Waterfield Road car park approval requiring that the car park be locked every evening/night.Rob Hemblade, our service manager at the time of the application had been advised that local residents would be willing to take on the role of "community custodians" - but this has subsequently not proven to be the case. As a formal planning condition that has now been passed to the council's Planning Enforcement Team the parks and countryside service as the original applicant, now has two options. 1. Pay an external contractor to undertake the required locking/unlocking ( which will also require. 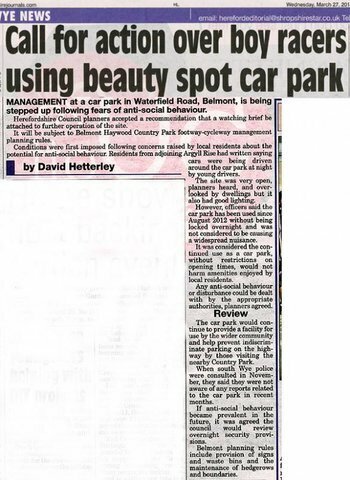 With no budget ever identified for the revenue funding of this car park or Belmont Haywood Country Park as a whole, and given that the cost of meeting the current condition is likely to be high with no "community custodians" being available. ( based on other sites up to Â£6-8K per year for 7 days a week lock/unlock) it would seem much more practical to pursue option 2 above and apply for a change of condition. The formal application for change of condition has been submitted. you can see this on the following http;//www.herefordshire.gov.uk/housing/planning/searchplanningapplications.aspx adding application number 123545. also comments can be made on line through the following link or by emailing planningenquiries@herefordshire.gov.uk by 13th february 2013. I do not think I have EVER seen a car drive in there let alone park, total waste of our money.